Even if you have never stitched or sewn before, you can teach yourself to embroider. 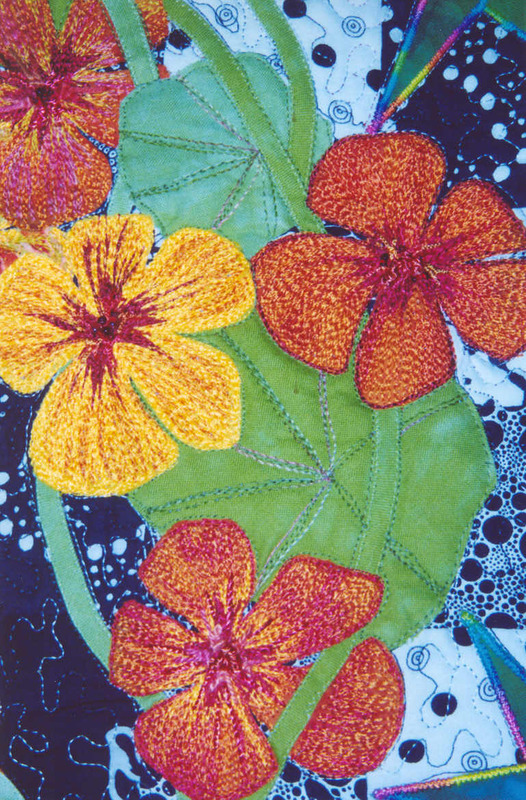 Since the invention of the needle, embroiderers have passed their art from one generation to the next, as experts taught novices directly through personal instruction. Only in the last 150 years (or so) have stitches enjoyed printed instructions, a boon to stitches who have no one to guide their fledgling attempts. Beginning embroidery is remarkably easy to learn on your own if you have the benefit of clear diagrams and simple instructions. Embroidery is an enjoyable pastime, a way to soothe your mind and soul. Your very first project can be an exciting and rewarding experience. As much as any other form of needlework, embroidery enables you to create pictures with needle and thread, and you can experience immediate satisfaction as images take shape beneath your fingers. , Embroidery offers other intangible pleasures. Your embroidery will bring beauty to your immediate life and offer you a means of self-expression. It allows you to create a significant and personal legacy for future generations to value. The materials for embroidery are inexpensive and easy to obtain. Cotton floss is the basic thread for beginning embroidery, and will thrill you with its rainbow of gorgeous colors. 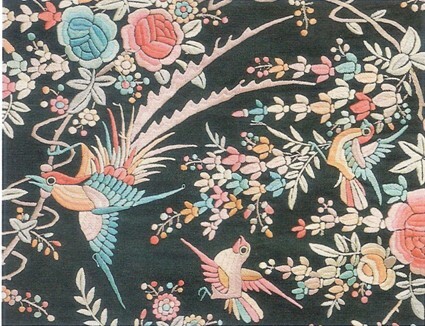 Your choices for embroidery fabric are many and varied, and need not be fancy or specialized. The only other essential items are needles, a hoop or frame, and some method to store your growing collection of thread. Most embroidery projects are compact and easy to transport so you may enjoy stitching wherever you go. You can duplicate the designs of needlework designers, or you can choose to stitch a design from other sources-in fact, the entire world of illustration and decorative arts awaits your selective eye. If you have drawing talent, you can create your own designs. And if you don’t, never worry-there’s a wealth of published designs to tempt you. WHAT IS EMBROIDERY? The word “embroidery” sometimes confuses people. For so~e, it is an umbrella term to describe all forms of needlework made with needle and thread upon an embroidery fabric, including cross-stitch, needlepoint, and samplers. Actually, these techniques fall into the category of counted-thread work, in which the stitcher follows a printed pattern on a chart or grid, then counts the fabric threads to determine the exact placement of each stitch. What we choose to call embroidery is free from these constraints, and is often referred to as “free embroidery” to signify freedom from having to count fabric threads. Reduced to its most elemental essence, embroidery fills in shapes to make a picture, using a variety of stitches. Usually the picture already exists as an outline, either drawn directly onto the fabric, or transferred by some other means You may follow this outline exactly or use it as an informal guide, taking small liberties by making adjustments to suit individual whim. 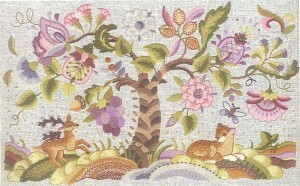 Human events also capture the attention of embroiderers. The finest depiction of the Norman invasion of England in 1066 A.D. was made with needle and thread rather than paint a quilt top: cotton on canvas. This work, the famous Bayeux Tapestry, is not a tapestry woven on a loom, but the labor of embroiderers who recorded a momentous event in a style so imaginative and lively that it continues to delight viewers today. Even current events find their way into embroidery. 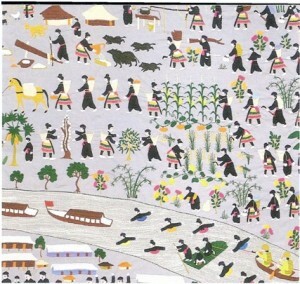 A noteworthy example is the contemporary quilt pictured above, a design that blends together the experiences of Hmong people of Cambodia who have emigrated to the United States. 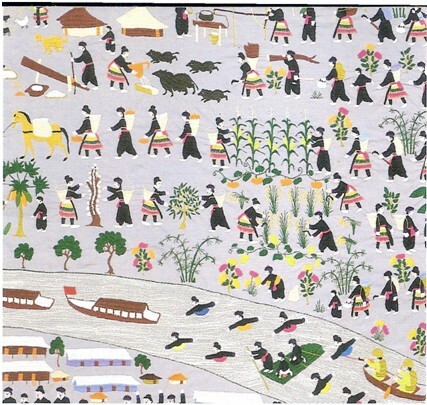 Stitched alongside idyllic scenes of their homeland are indications of the recent political upheaval that spurred their journey. This design speaks as eloquently of a culture’s history as any written words could.